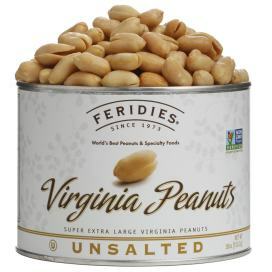 FERIDIES super, extra-large Unsalted Virginia Peanuts are very popular among our health conscious nut lovers. Without salt, you can taste the natural sweetness of these deliciously crunchy peanuts roasted to perfection. • Healthy Source of Macronutrients. 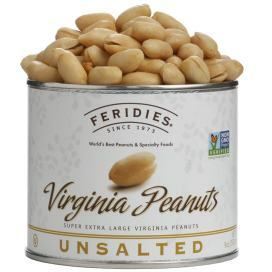 Unsalted Virginia Peanuts include all three macronutrients - carbohydrates, fats, and protein. According to the U.S. Department of Agriculture, peanuts are a great source of protein, making them an ideal snack. Even if you only eat approximately 1.5 ounces of them, you can enjoy a 3 ounce equivalent of protein. The fat contained in unsalted peanuts is considered to be healthy for you. A 1.5 ounce serve contains approximately 21 grams of fat as well as 3 grams of saturated fat. Per handful, they contain approximately 9 grams of carbohydrates, 3.4 grams of dietary fiber, and a whole lot of flavor. • Lots of minerals. Unsalted nuts are a rich source of manganese. In a handful, you will find approximately .88 milligrams of manganese. This is slightly less than half of the recommended amount for women to digest on a daily basis and one-third of the amount for men. Manganese is a mineral that helps you break down food and digest it. Manganese is not the only mineral that is present, however. Some of the other minerals, though with slightly lower amounts, include phosphorus, potassium, and zinc. • Good source of vitamins. There are lots of vitamins in unsalted nuts to go along with those minerals. One of the vitamins that is most present is niacin or Vitamin B-3. This vitamin helps support your metabolism and you do not need much of it per day. For women, it is recommended that 14 milligrams be eaten and for men it is only 16 milligrams. 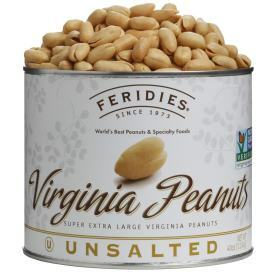 One handful of our Virginia peanuts contains about 5.8 milligrams. Some of the other vitamins that you will find in unsalted peanuts includes vitamins B-1, B-6 and E.
As you can see there are many health benefits to eating unsalted peanuts. Whether you are looking for a healthy snack or simply want to enjoy the health benefits, our Virginia peanuts are a great option. Try some of our unsalted nuts today to experience the difference.